Our tentative meal plan for most of the trip is steak and potatoes, with the occasional side of asparagus, and ice cream sandwiches for dessert. The major exception to that rule is Kansas – where we want to primarily eat seafood. Just kidding! Our meal choices will (most likely) revolve around the ease at which they can be cooked and a low weight-to-energy ratio. We are planning to carry at least a couple days worth of food with us though at all times, in case we find ourselves in between towns or cities with any decent restaurants or grocery stores. If worse comes to worst though, Rachel has been brushing up on her survival skills (mainly scavenging but she’s also learning how to build a bow-and arrow), and I am expecting there to be plenty of roadkill to choose from along the way. 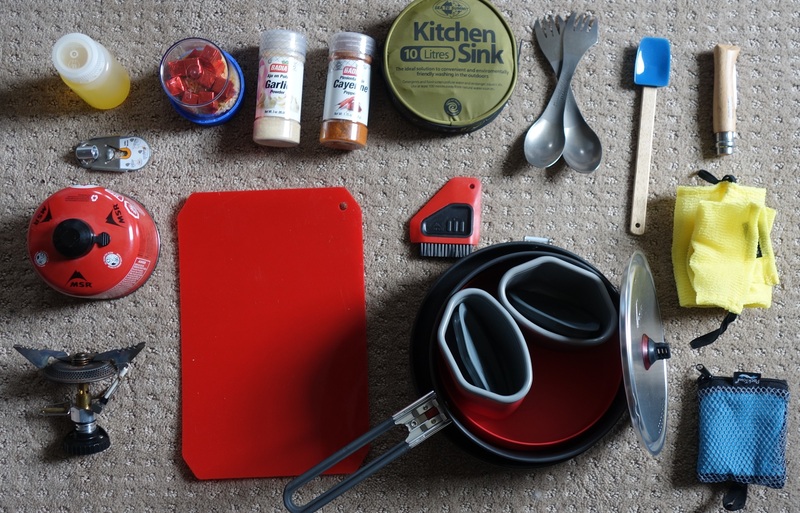 To cook all of these items, we have a fairly minimal cook set, with only 1 pot & 1 pan to use with our camping stove. We will bring an assortment of accessories for cooking and eating, but are aiming to weed out anything that may not get used frequently and can be substituted for others that are multi-purposed.